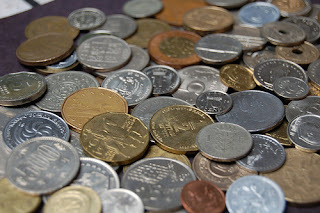 Do you have piles of coins somewhere in your home? You come home, empty your pockets - and there it sits, slipping and sliding all over the place. You could make things more organized by simply using an extra coffee mug - or any other spare container - to control the change. 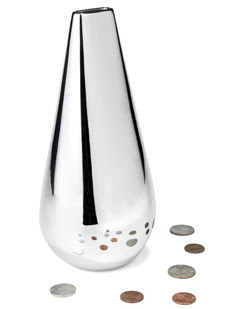 Or you could be a traditionalist, and use a piggy bank (or, more generically, a money bank or coin box). Here are just some of the many options. Caution: I can't always tell if these banks have a plug for removing the money - something you probably want to find out before choosing a bank. 1. 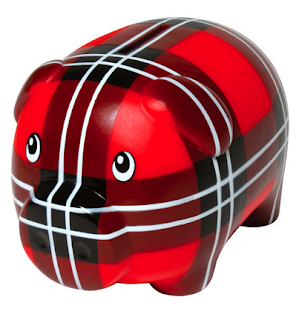 Let's start with the pigs - specifically, the Bud Posh Pigs from Designroom, in 15 patterns, available from many web sites around the world. Update on July 8, 2012: These are now getting much harder to find, although you can still find some, if not in this pattern. 2. 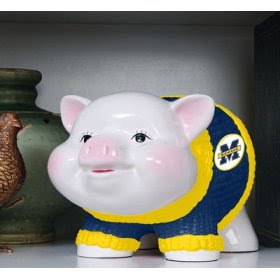 You can find handmade, often one-of-a-kind piggy banks on Etsy - including this one made by Sara Marymee. Update on Oct. 17, 2014: Sarah doesn't make piggy banks any more. 3. 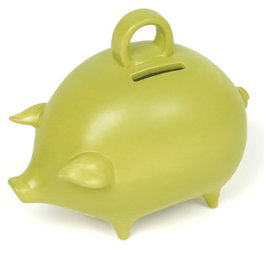 The COINK piggy bank is another one that's widely available. 4. FansEdge provides pigs wearing sweaters from your favorite teams (United States only). The one above is a University of Michigan Wolverine - guess where I went to college? 5. 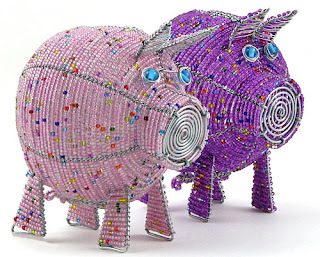 Here are some African fair trade beaded piggy banks. 6. 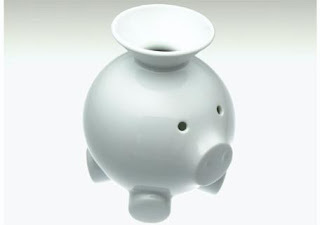 And if you'd like a more traditional piggy bank, this one comes in white or green. Update on March 4, 2010: This bank doesn't seem to be available any more. 7. 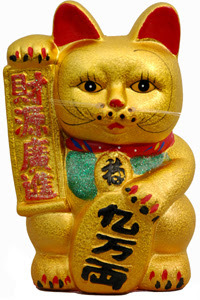 Moving beyond pigs, the Japanese Maneki Neko cat is often used for banks. This is just one of many many designs. 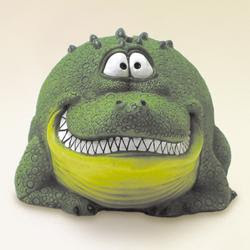 8. theBIGzoo.com has twelve different animals to choose from, including this alligator. Update on Oct. 17, 2014: theBIGzoo.com no longer has this bank, and the banks it does have aren't anywhere near as appealing. 9. Or what about a pigeon? [via Better Living Through Design] Update on March 4, 2010: This bank doesn't appear to be available any more. 10. 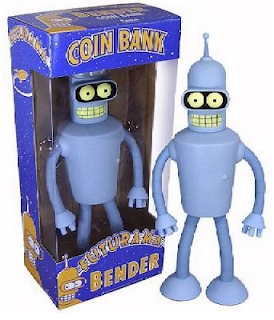 Even the fictional robot Bender has been made into a bank. (Never heard of Bender? You can read about him on Wikipedia.) Update on July 8, 2012: I'm only finding this for sale on sites like eBay now. 11. 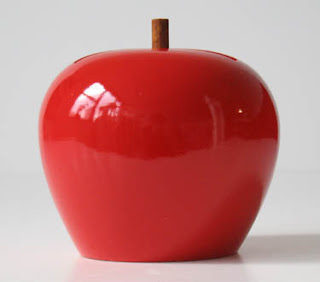 This wooden apple bank comes from the Jura region of France. 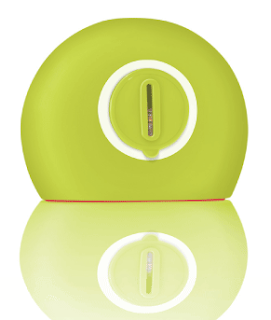 Update on March 4, 2010: The apple is no longer available, but you can get a lady bug bank from the same region. 12. 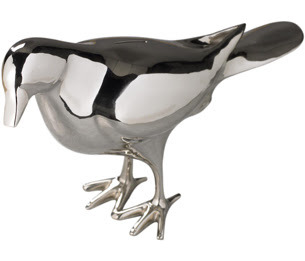 The Volcoino bank is simple and elegant. [via Uncrate] Update on Oct. 17, 2014: I'm no longer finding this bank. 13. The bankabank is another simple and very functional design; it's available in pink, green, and black. 14. 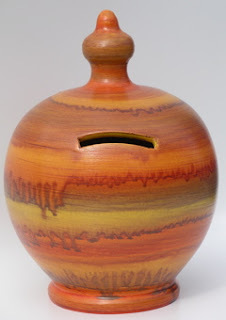 Finally, take a look at the Terramundi money pots, available in 125 designs. I just came across your blog. 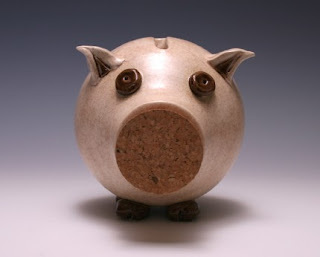 We appreciate your sharing our handmade fair trade beaded piggy bank with your readers! It, and all our beaded animals, are really beautiful and unique! Is there anywhere in Australia where I can purchase either the Bankabank or Coink by Mint? 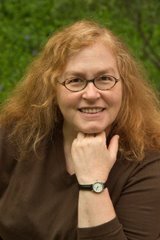 Angelica Joy, a quick search on Google didn't find those banks at any Australian stores or web sites. Besides the site listed in the post, I found Coink here, here and here. Two of those are baby-oriented stores.